The chilly weather in Wisconsin has got me feeling like fall will soon be coming to an end so I am trying to savor all my fall treats while I still can. One of my favorite fall indulgences is Apple Cider. 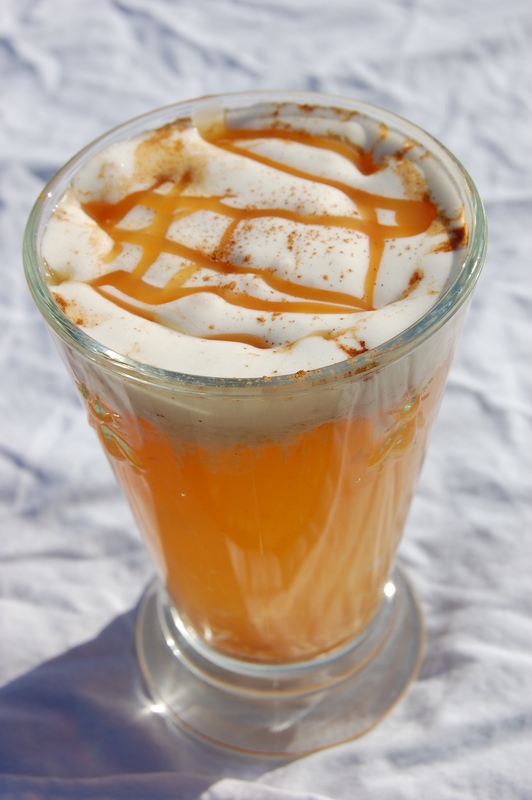 I wanted to make it more of a dessert than just a drink, so I whipped up this Caramel Apple Cider Float. The combination of apple cider and ice cream was delicious! Warm your glass of Apple Cider. Add 1-2 Tablespoons of caramel topping and stir until dissolved. Top with a scoop of vanilla ice cream followed by a sprinkle of cinnamon and a drizzle of caramel. The ice cream melts into the cider making it extra rich and delicious! You could also get creative and use an ice cream flavor such as butter pecan or peanut butter swirl. How delicious does this sound! Perfect for fall.